"It's not the fall that kills you, it's the abrupt impact at the bottom," is a favorite expression of rock climbers, sky-divers and other high-flying adventurists. Unfortunately, that type of cause and effect relationship is difficult to establish for geologists researching the relationship between a mass extinction and an impact event, which both occurred 65 million years ago. Despite widespread acceptance that the two events are related, the exact mechanisms responsible for the disappearance of the dinosaurs and 75 percent of all species at the Cretaceous-Tertiary (K/T) boundary, are still uncertain. 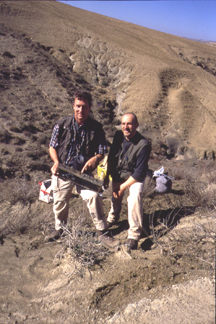 Researchers take a sample from the K/T boundary at the El Kef exposure in northern Tunisia. Image courtesy of Simone Galeotti. In this month's issue of Geology, Simone Galeotti at the University of Urbino in Italy and co-workers present new research that bolsters the idea that the meteorite impact, near the Yucatan Peninsula in the Gulf of Mexico, blasted huge quantities of dust and particles into the atmosphere, blocking out the sun and causing a global winter. Although the so-called impact-winter hypothesis may be popular among the media, little evidence supports it, and other possible extinction mechanisms abound, including global wildfires (Geotimes, January 2004), greenhouse warming, acid rain, volcanic eruptions, tsunamis and every combination in between. "This is the first good evidence of an impact winter," says Matthew Huber a climatologist at Purdue University in Indiana and co-author on the Geology paper. "There are hints of evidence elsewhere, but they usually could be interpreted in more than one way." Elisabetta Pierazzo at the Planetary Science Institute in Tucson, Ariz., agrees, adding that the new research has, "opened a window on a critical stage we have not been able to access directly so far." Usually, researchers use oxygen isotopes to constrain paleoclimatic temperatures, but repeated sampling has resulted in drastically different interpretations. "Oxygen isotopes are essentially garbage through this interval, at least at this site and probably at the others," Huber says. And accurate oxygen-isotope signals are notoriously hard to obtain across the K/T boundary for a variety of reasons, including dissolution and reworking of the sediments. Thus, instead of relying solely on isotopic data, Galeotti's team searched for fossil assemblages that survived the extinction event and could provide temperature proxies across the boundary. They studied a section of marine shales considered the "type section" for the K/T boundary in the small town of El Kef in northern Tunisia. "The interesting twist is that they focus not on the extinction itself, but on the survivors, those who made it through the event," Pierazzo says. Galeotti and colleagues' results indicate that communities of cold-water organisms expanded into typically warmer regions of the ocean following the impact, suggestive of global cooling. Surprisingly, the researchers write, the cold snap lasted for roughly 2,000 years before the marine communities returned to normal. Computer models of an impact winter, however, suggest colder than normal temperatures for only two to 12 years. The discrepancy may arise because conventional computer models have traditionally focused on surface temperatures. Many of the microorganisms Galeotti's team sampled at El Kef recorded bottom-water temperature. "While after about a decade the solar radiation reaching the Earth's surface may have returned to its normal value, the ocean, because of its higher thermal inertia, will take longer to react," Pierazzo says. Revised computer models confirm that although the input of cold water into the oceans may have been rapid, due to density differences the colder water remained in the deep ocean for longer durations and presumably supported the colder water communities. Galeotti says that he hopes their multidisciplinary approach  combining modeling efforts and field evidence  will help meet a growing demand for credibility and cooperation, in a field often characterized by dissent and controversy. He also hopes, he says, the new research will revitalize interest in the impact-winter hypothesis and help resolve some of the questions swirling around the K/T mass extinction. In the end, Huber says, it may have been an amalgamation of catastrophes that led to the dinosaurs' demise. "Many bad things that appear to have happened at or just before the K/T led to the extinctions," he says. "They all sound pretty bad to me and I'm glad I wasn't around for any of them."